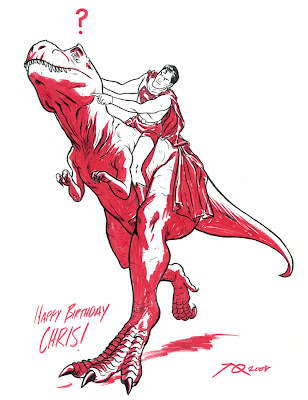 Joe Quinones' interweb-log: Happy (Belated) Birthday Chris Haley! Happy (Belated) Birthday Chris Haley! Very belated. I think it was roughly a month ago. Anyhow, April Steele commissioned this piece for Chris which I think just reached him in the mail today. Oh yes. What exactly is pictured here? Well that's none other than the 'Man of Steel' riding the 'Devil Dinosaur'! ...This was explicitly asked for. I am basically the luckiest of dudes. And, of course, though it goes without saying, let me say, thank you so much, man! To quote one of our favorite professors, "That wouldn't work." Nevertheless, it's a nice piece. This one is awesome! Love the use of the red for the shading.